If you’ve ever noticed small pinholes of light on your frontlit ebook reader, you’re not alone. It’s actually a fairly common defect among E Ink ebook readers. All brands are susceptible to it, Kindles, Kobos, Onyx’s Android ereaders, and others. The only ebook readers immune to the issue are ereaders without frontlights, and probably the Kindle Voyage and Kobo Aura are less vulnerable to it since their frontlights are under glass. Pinholes of light can develop over time, but it’s not uncommon to get an ebook reader with the issue from the very beginning. The Kindle Paperwhite 3 that I just reviewed last month came out of the box with a small pinhole of light visible in the lower right corner, as shown in the picture above. I personally don’t find it distracting, mostly because I always use lower light levels and frontlight pinholes are usually only visible at higher brightness settings. But if it was in the middle of the screen it would be a different story. Some people elect to exchange their ereaders when they get one with noticeable pinholes of light shining through, which is understandable. But if it’s off to the side and it doesn’t catch your eye then it’s probably not a big enough problem to worry about. It’s a quite common issue, after all. I’ve noticed with some ereaders that pinholes of light are visible but only at really wide angles, like when looking down from the top of the screen. They aren’t visible at all when looking straight at the screen. If an ereader’s screen is impacted by something with sharp edges, it can tear a small hole in the frontlight layer as well, which causes a bright spot where the light shines through. That’s why it’s always important to keep your ebook reader in a cover because the screens are fragile in more ways than one (E Ink screens also crack very easily). 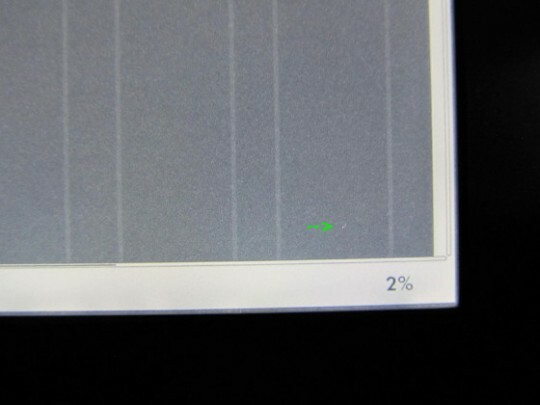 The layer used to help evenly distribute the frontlight’s glow across the screen can be easily damaged. I had a Kobo Aura that was littered with pinholes from the moment I bought it. Even more popped up as time went on. The more I think about it, the more I believe E-ink readers are overpriced for what you get, especially with all the defects and inconsistencies. I just purchased a new Asus Zenpad 8 and although I love my Voyage, im left scratching my head justifying it’s price and keeping it. I know were talking two different technologies and yes it’s easier to read on the Voyage but damn the Zenpad is beautiful and the specs are mind blowing for the $200 you pay (same as Voyage). Larger, faster, sd card, more versatile, options, etc. The more I use mt Zenpad, the more I believe my Voyage shouldn’t cost more than $80. I’d say the Voyage is overpriced, rather than eInk ereaders as a whole. With them, I enjoy being able to read in direct sunlight for hours on end without worrying about running out of battery. Plus,the Kobo Aura is $99, the Kobo Mini was on at $49 for awhile, and the Paperwhite has also been at $99. They’re all pretty good for what they do, and while they’re not good for an browsing like a tablet, they’re perfect for reading ebooks. Plus, there’s very few waterproof tablets, and none of there for less than $400. Until tablets are able to run with screen on times of days or weeks without recharging, I’m not as sold on them for reading. Unless they’re PDF files, anyways. I can’t say they’re only worth $50 at most, not without seeing the price of the parts, assembly, and development. Ereaders aren’t disposable commodities, nor do I suspect that eInk panels are as cheap as you feel they are. Now, under $100 is where I want a lot of ereaders to be… but Amazon seems to have stopped subsidizing their readers with the Voyage. If anything, they’ve decided to pile on the costs. That’s one reason I’m sticking with my Paperwhite and my Kobo readers. Eric, Asus Zenpad its a tablet. And that’s all what I wanted to say. Ereaders are for people that love books. Tablets are fore everyone else. I still want an eInk-reader with decent browsing and Android. My Sony T1 was good until higher resolutions and frontlight eInk-Readers came out. It still good, but clearly dated and has developed the “jump 2 page” with one-page-forward-syndrome. They should sell them with a cover. And/or a warning that a cover is required.